For one of my core classes at Otis I developed a film festival designed to bring loyalty to a new middle ground political party. My 15 week progress is captured in detail under each tab below. The umbrella topic for this film festival surrounded the presidential campaign trail. After a few possibilities I decided to go in the direction of highlighting a failing democracy. America claims to have the greatest democracy. I can agree to a certain extent. Politicians are chosen and voted for initial promising reasons yet as soon as they attain their desired government position a new agenda is installed. It is not old news that we see our government under the mercy of large corporations and the power elite but it is news to individuals that can surely make the difference in years to come, American voters. Recent protest have gone on under the grass roots movement “Occupy,” but with no agenda on hand, leaders nor organization, this movement to reset our democracy to serve all people—not just the really wealthy—some direction (solution) needs to guide their collective voice. Our only voice is the vote and it appears in two forms, the traditional vote for government officials and the consumer vote. But in this consumerist driven society our vote may very well be dictated even before we even think of buying that next product or begin to know our next presidential candidate. With this issue I chose to introduce a selected series of films: Fishead, Birth of a Party, Capitalism: A Love Story and, The High Price of Materialism. Eventually I rid the film festival of the widely known Michael Moore documentary and focused to bring the rest of the three films to live in my film festival. I was given the task to present to the class my film selection and give reason behind my selection. After my presentation I was given the green light to continue with my selection. This week I was tasked to find inspiration for my film festival posters in carefully selected backgrounds, images, fonts, typography, objects, etc. I ventured off with my digital camera, taking pictures of anything I might possibly think of using to depict the films I had selected. This was somewhat challenging since I had to not only curate images of inspiration but also find a purpose and a meaning behind the selection. Most of the images I had in the end didn’t hold up to the latter, thinning my selection. For this week I had to utilize my collected images to develop 36 total mini posters for my film festival. I created 12 mini posters for each film categorized by digital type, non-digital type, treated photos and untreated photos. In the process I began to pull images and type that would best depict singular points of my selected films respectively. For the documentary Fishead I focused on the capitalist society we live in and wanted to relate America to the pyramid structure talked about in the film. With this direction I developed the American flag pyramid that symbolized capitalism in America. I also wanted to show the constant political battles in our government with Paul Ryan’s bow and arrow shot. The last image concentrated on the way I see the capitalist mindset in America—a rotting corpse. To depict Birth of a Party I chose a tunnel image for the singular focus these individuals had throughout the documentary. There was also the hanging light bulb to represent the deadly ideas along with the pointing of the fingers image. I chose other relatable images and created an “All Alone” tagline that could possibly define the posters in the end. The layout wasn’t working out too well so I had to bear the results. It was a trial an error process that I had to trust. Mini posters for The High Price of Materialism had to show the different characteristics I picked up from this short animated film. Some of the various messages where entrapment, false happiness, ignoring signals, uncontrollable, guided direction, and loss of power. I wanted to show the effects of consumerism on my target audience. This poster needed to speak to them, as they are the majority affected by the decisions at the top. Through my film festival I wanted to let them see the problems and offer them solutions. With these developed 12 mini posters I was then tasked to refine 4 film festival posters per film and 6 posters for the film festival itself. In doing this I decided to sketch out some ideas on my notebook to allow me some sort of room for direction. I wanted to try the rudimentary approach of sketching ideas and committing to ideas only after being rendered in pencil. This technique does take longer but the results are highly beneficial. For the rest of the three film posters I refined what I had already had in the week prior. This consisted of rearranging some with new images or text. I wanted to try some new layouts and see what the critique would bring. At this point I was moving towards the direction of solving issues with my festival. I wanted to provide the American people with a third presidential candidate answer. Although we currently have third parties lurking in the background, most of the economic support isn’t there due to the absence of publicity. Many like Ross Perot have tried but none have succeeded to gain momentum and recognition. With this film festival I want to show the American people why we need that third party middle ground—a party that responds to the American people not just in election season but all throughout their tenure in office. For this week I designed a style guide that would define my film festival. I chose to work with a color palette that would relate back to our American government but added the black and yellow I introduced in the weeks prior. I decided to work with Bebas Neue and Arvil Sans—two fonts that explored beyond the traditional campaign identities. I also wanted to introduce a few icons and graphics that would be utilized to represent this new American Party. The downward hand would represent the help the American Party would serve; this was a way to personify the new political party. I also developed the star and three stripes to encourage individuals to call upon the third party. I wanted to increase the demand for a new party and symbols would facilitate this pseudo grassroots movement. 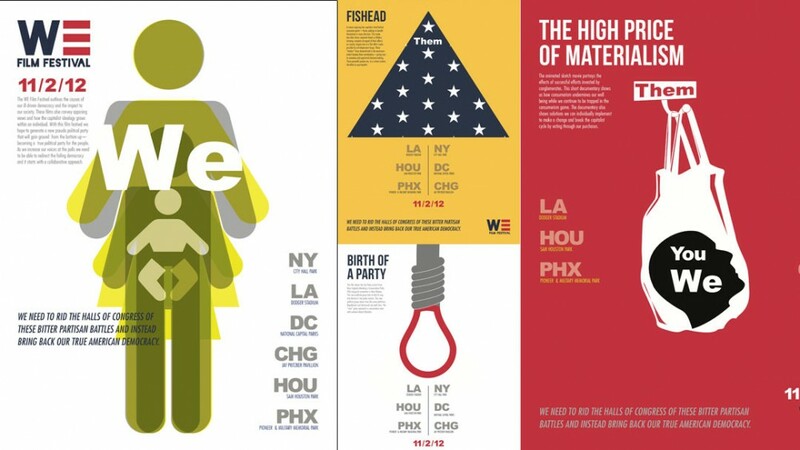 This week called for a refined serialized set of posters. I wanted to implement as many constants as possible in order to in some way remain safe. I felt I could not venture off into drastic variations between my posters that I needed to start at a solid base. I had the urge of screen printing my posters but after research and strategizing I realized time wouldn’t allow me to complete this task. My designs incorporated too many colors and layers that would hold me back only using 2 screens. 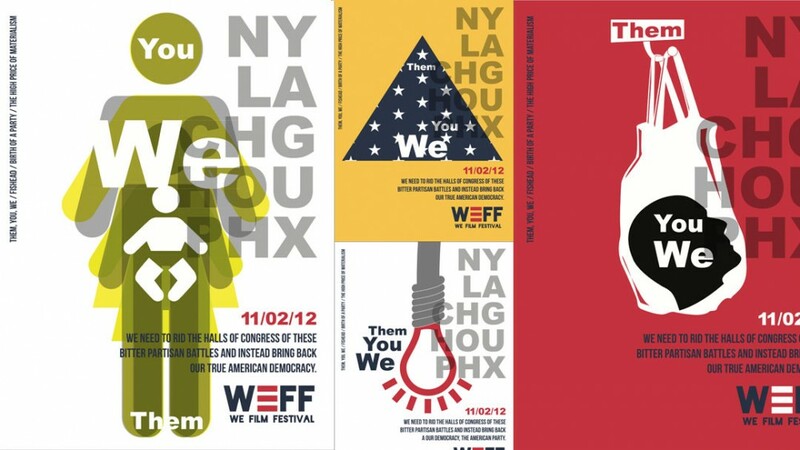 On the final week of film festival poster designs it was more of working on the small little details within our series. Color adjustments and proof reading took most of my time this week. After having a few disastrous weeks with misspellings and grammar issues I had to redeem myself and show I was capable of more than just design. As I was learning, this class consisted of more than just designing posters. 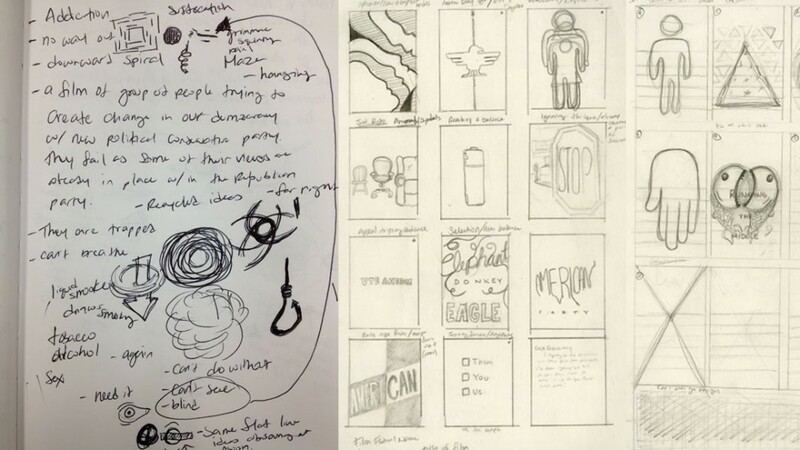 It called for deep conceptual systems that had function, effective language communication beyond the visuals, and precise interpretations of our intentions between every design move. This class required careful considerations that took it to a new level of design—something I hadn’t been use to before. Getting ready for the second half of this course and to continue our film festival efforts, I switched from graphic designer to film maker, script writer and director. This was an interesting shift. In trying to come up with a concept to support my failing democracy film festival I focused on exposing the failing politicians that run our country. It is their decisions and selfish motives that have driven this country into what I call a top down democracy. Instead of operating for the people how it was written in our constitution, we are controlled by the power elite, which is a mixture of corporate heads, government officials and top ranked military officials. I decided I would do a title sequence for a reality TV show called Run It. This show would shadow political leaders through their campaigns, pre and post elections. It would be a publicity stunt opportunity for these politicians but most of all hold them accountable for the better of our nation. There are just too many political heads that run on false policies that are soon reinvented once they have taken office. For a video film I also went in the direction of a full conceptual short film. This film idea was called Rescue. The film would conceptually describe the failing ideas our political leaders are offering to the American people. Quotes would complement the swinging noose and light bulb so as to reiterate the dying democracy. My second concept revolved around a short typographic film that was a poetic piece calling for Americans to rise as a collective group and fight the injustices of our deteriorating democracy. I also developed the additional typographic piece that would utilize various George Carlin quotes I repurposed from Youtube. These snippets of quotes are part of his stand up comedy where he bashes on our democracy and political leaders. I wanted to focus on failing politicians and this seemed like the perfect direction for my fourth film. After the previous week’s critique I realized that I needed to develop a stronger concept to effectively relay my message. It needed to be relevant and so I took from what had gone on in the last Romney-Obama debate. Romney talked about shutting down Big Bird so I immediately thought of making a Sesame Street parody wrapped around political satire. The show, Lawghing, would serve many underlying messages. The main points would be a show that praised ill driven political leaders ironically applauding their efforts and making fun of them in a nicely packaged comedy puppet show. For this I searched through a website called Fiverr.com where I researched various puppeteers that would aid me in producing this show. Out of my selection of promising candidates I was then led to develop characters that would fit their puppet persona. After strategizing who was who, I created a series of skits/segments pertaining to each character and later sequenced them to create a cohesive show. For the intro and outro of this show I wanted to introduce an iconic figure that resembled revolution and activism, this being Guy Fawkes. Recently used for the Occupy movement and Anonymous group efforts, I felt this would fit in nicely to my concept of mocking our political leaders. This would help tie in those efforts that seem unorganized and fragmented. In the end my film festival’s purpose is to bring a challenging collective voice up against political leaders too comfortable to change their ways and policies. After a great reception of my puppet show video I decided to focus production efforts in refining the message of the show. Not being able to change entire skit structures and dialogue I was left with either adding or rearranging skits around to clarify my intended holistic message. Very little was done this week as my critique was left at a “no comment.” I learned that when this happens one needs say “thank you” and walk away a soon as possible. Knowing I had two weeks to work on my puppet show, Lawghing, I managed to introduce a new host named Mark W. Grey. To the request of the puppeteer I had to keep his puppet’s name in tact and so I did. I just provided him with an intro and outro script in which he would act out on backgrounds within the White House. This is where a bit of the irony played in thanking politicians like Mitt Romney for allowing them, the puppets, to keep a job. In the intro I made reference to Romney by having Mr. Grey thank the show’s sponsor Gain Capital, which is a twist on Romney’s former company Bain Capital. Not being a comedy writer myself I tried to make the best of it and develop relevant word play. For the closing of this show I wrote a poem that explores our minds. I wanted to depict the way our politicians run during election season. They all try to give a sense of honesty, pushing for the little guy. They all run slightly in the middle when it comes to presidential candidates; at least in the recent presidential campaigns. I gave the show a black and yellow color palette just to keep in line with my style guide I had developed previously. This color palette is an evolution of the played out activist red, white and black. I felt this film festival needed to move in a new direction, attracting a new generation of audience. My show was approved and I now needed to revisit my film festival posters. I had received some positive feedback on my posters in week 7 but I know there was plenty of work to be done. There were concerns over my hierarchy and grid structure. I was told it was very loose and needed to be reprocessed. I also needed to rethink the poster for Birth of a Party. Unfortunately my hanging light bulb idea that transformed into a noose was a cliché for some reason. I though it was a great idea. Although traditionally a light bulb is used to represent an idea, I had never seen this transformation and orientation applied to the light bulb. I moved on to depict the tunnel vision these diplomats had throughout their documentary. They were closed minded and only focused on what benefited them as a group—one of the reasons why they weren’t gaining any support throughout their mini conventions. With this in mind I wanted to depict this tunnel vision but in a deadly way. Their ideas seemed fatal. Most of their ideas were exactly the same as Republicans and Tea Party members. I came up with the idea of representing this tunnel vision by presenting the viewer with the frontal barrel view of a handgun. This would represent both points, fatal and a singular viewpoint. Getting some feedback on certain conflicting aspects of my posters I decided to restructure my posters. I added more information concerning time and dates as well as literature explaining each of the film’s plot. I decided to work around a 6-column grid to give me versatility and layout variety. I wanted to keep the cities predominant throughout my posters as I intended for the posters to be ambassadors for smaller city directed posters that would appear within each city. These smaller posters within each city would hold more information about the film festival screening. Information like quotes from the producer, reviews, and larger film titles. I felt communicating screening locations seemed more important as the graphics would serve as an identifying piece for each film. To depict the last troubling film, Birth of a Party, I looked for different avenues to approach this obstacle. These individuals seemed to ignore all signs of failure and so I moved towards regular signs we are exposed to on daily basis. It seemed like a modified stop sign and a fallen cone would best represent this idea. I am certain that if I were to go out and remove the letters from a stop sign and tip all the cones from a construction site, people would still abide by the mere presence of these signs. The alteration of these roads signs would trigger their mind to say something is wrong but their lack of initiative would lead them to just proceed as usual. With no collective effort to find out why the signs were altered would lead individuals to continue as normal; an interesting characteristic taken up by individuals backing up the Conservative Party. After a brutal critique I had to rethink my design efforts. I had to concentrate on developing a sound function of my design decisions and having those functions dictate my layouts. My grid structure needed to be trimmed down to 4 columns and I needed to be more simplistic with my graphics. Apparently my altered sign ideas weren’t resonating and conveying my intended message. At this point I had no clue where I should start in depicting Birth of a Party. I had dedicated way too much time in developing the concept ideas the week prior that I ran out of ideas for this week.